Chris Brown and Shane Morton at The Lab. Photo courtesy of Adult Swim. 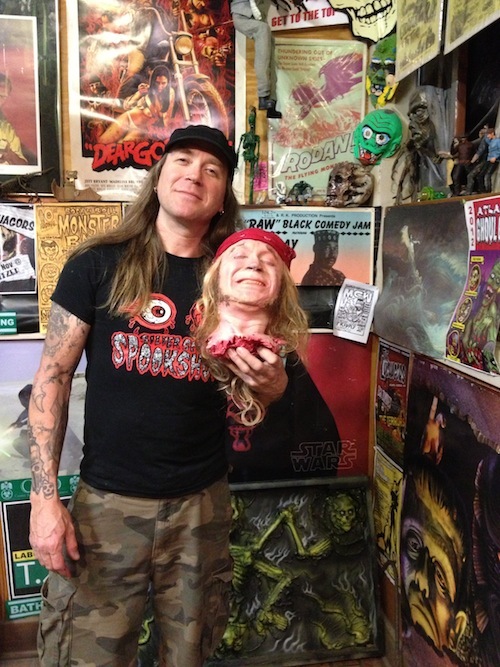 When Shane Morton, aka Atlanta’s Renaissance man of horror, and Chris Brown, mad mastermind of Macabre Puppets and the bloody musical SCARLET’S WEB (Dad’s Garage), first got involved with Adult Swim‘s YOUR PRETTY FACE IS GOING TO HELL, they immediately realized this grotesque and groovy gig was their dream, or should we say nightmare, job. The initial assignment was special effects makeup, but the show didn’t have an art director yet. It’s a story Shane has already told colorfully in several articles, but he asked them for a couple of days to film a make-up test to prove the pair could transform humans into demons in 45 minutes, then he got to work on sketches and models. Being old-school Ray Harryhausen fans, Shane and Chris wanted to do as much as possible with miniatures, but budgets and technological advances dictated a balance between digital effects for lava flows and heads spinning like Linda Blair and the old ways for blood spurts and HR Geiger-esque urinals. Still, the pair didn’t have to do much to convince everyone to let them take over much of what perhaps a little ironically is called the “practical” effects for the series. Ever since the Middle Ages, comedies about deals with the Devil have proven a surefire hit. Think about such Retro cult classic movies as BEDAZZLED (The 1967 version, of course, starring Peter Cook and Dudley Moore) and POOR DEVIL (TV, 1971), starring Sammy Davis Jr. and Christopher Lee). YOUR PRETTY FACE IS GOING TO HELL mixes in-your-face crassness and generous gore with office comedy, reimagining Hades as a contemporary cubicle-ridden setting. 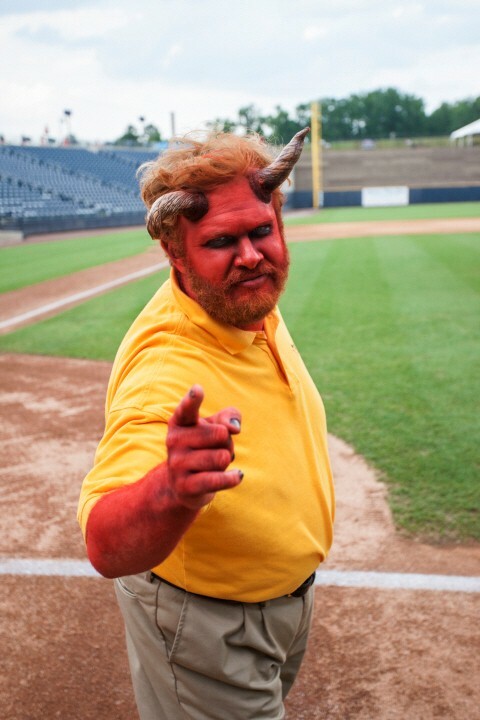 Demon Gary (played by Henry Zebrowski) is dedicated but far too much of a screw-up to earn a promotion. Yet it’s hard not to empathize with the well-meaning “associate” because we all like to complain about our bosses, but his, well, has to be worst because it’s Satan. The original live-action series is created and directed by Dave Willis (AQUA TEEN HUNGER FORCE, SQUIDBILLIES) and Casper Kelly (SQUIDBILLIES, HARVEY BIRDMAN: ATTORNEY AT LAW; STROKER & HOOP). The final installment of the six-episode run airs this Thursday May 23, 2013, at midnight. Henry Zebrowski stars as Gary the demon in YOUR PRETTY FACE IS GOING TO HELL. Photo courtesy of Adult Swim. That process became trickier when on location, such as for the third episode, “Take Life By the Horns,” in which Gary found himself fallen into a ravine. That shoot involved dodging poison ivy and copperhead snakes and having to rappel camera equipment down the side of a mountain, Chris recalls. After make-up, the pair would launch into preparing the special effects and any additional props needed for the day. Sometimes that could be blood or pus or a potion of extreme projectile vomit, also needed for the ravine shoot. “We had a limited amount of time, so I literally used a sump pump, like you use to bail water out of your basement,” Chris says. “I put together a big plunger and a giant syringe, and then opened the nozzle to spew out a rainbow collection, which included stew, cream of mushroom soup, I made some gelatin and crunched up into chunks. The smell quickly turned rancid so it even smelled like vomit.” In addition, Gary broke his leg from the fall down the cliff, and Chris had to create nauseating pus to spew from the wound. 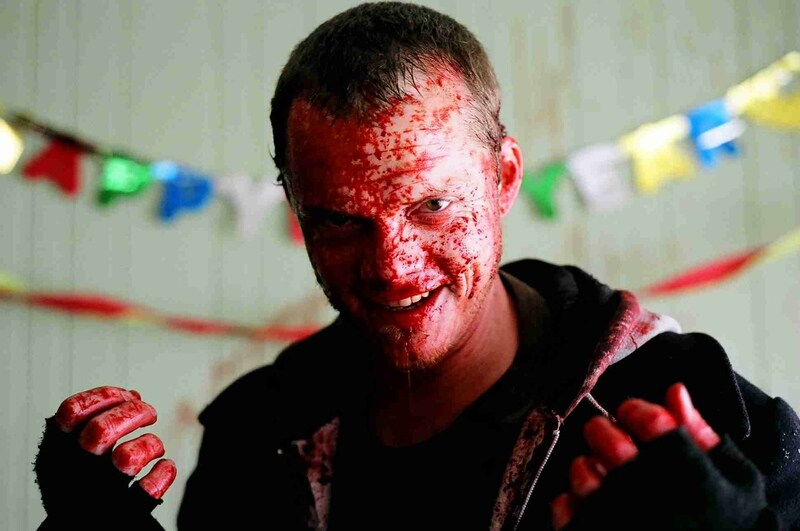 Yes, it did involve black blood, red blood and tapioca pudding! Satan (Matt Servitto) gets a touch-up from Shane Morton. 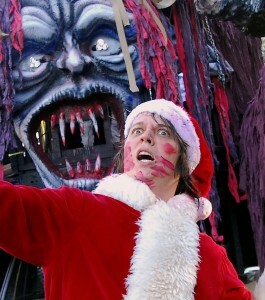 Photo courtesy of Adult Swim. 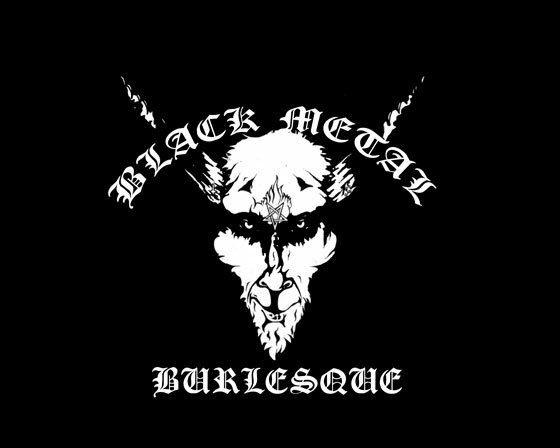 A secret ingredient underneath Satan’s furry legs was spandex tights, that could easily be changed out if Matt Servitto, the actor who plays Satan, felt sweaty. A lycra lining gave four-way stretch which, as Shane notes, even allowed Matt to do David Lee Roth kicks in a photo shoot. As for costume maintenance, well, “it was like combing out a big dog,” Chris says. Shane Morton at work on Claude (Craig Rowin), Gary's over-dedicated intern in YOUR PRETTY FACE IS GOING TO HELL. Photo courtesy of Adult Swim. Shane went home and crafted a miniature model, brought it in, and got the greenlight to create a urinal that looks like an extra-large facehugger. He toyed with various color ideas but finally decided that the bathrooms otherwise would be spotless in Hell. Shane holds up his own head, a prop he crafted for DEAR GOD! NO! Photo courtesy of Adult Swim. As the season draws to a close, the pair are now just waiting to hear the final ratings and whether the show gets greenlit for a second season. If yes, they’re hoping for a bigger budget and the chance to play around more with more practical special effects over CGI–“to raise the bar,” as Chris says. “If we end up getting multiple seasons, it’s only going to get more extreme,” he adds. And maybe there’ll even be a cameo for that giant spider with the humungous nut-sack hanging on his back that turned out to be expensive to cast. Editor’s Note: Shane and Chris are just a few of the talented local folk streaming by in the end credits of YOUR PRETTY FACE. 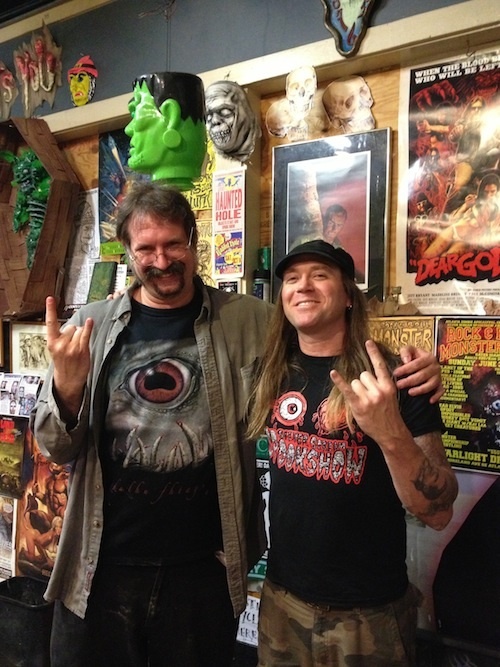 More ATLRetro friends include producer Linda Burns (V/H/S, THE SIGNAL), set decorator/property master Laurie Garner, who’s played bass in so many Atlanta bands (She-Monster and Vietnam to name a few), and the indomitable Eddie Ray (SATANIC PANIC BAND OUT OF HELL and a previous Kool Kat to boot!). ALSO: Learn some of the make-up secrets Shane Morton used in YOUR PRETTY FACE IS GOING TO HELL at his Monster Make-up Class on Sunday May 26 in his Lab at AZA. For more details, visit the Facebook Event Page here.